Obi-Wan Kenobi. Legendary Jedi, but also a general for the Army of the Republic. We usually only got to see Obi Wan as the grizzled old hermit, or the young eager padawan. 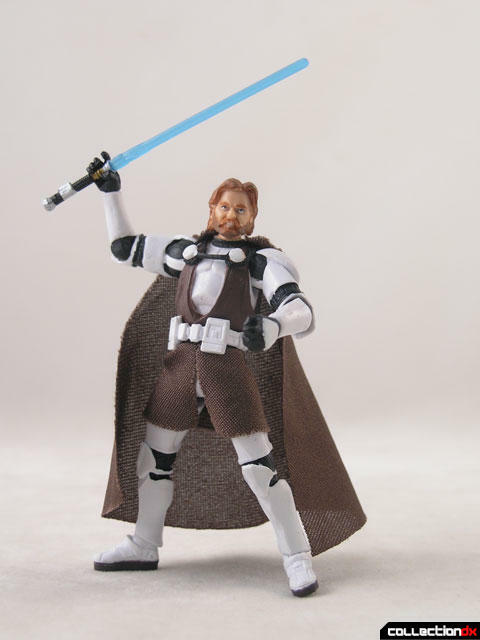 The Clone Wars series showed us General Kenobi in action. Obi-Wan was not a general who issued commands safe from his bunker. No, Obi-Wan got right out in the front lines with the clone troopers, and did battle in the thick of it. 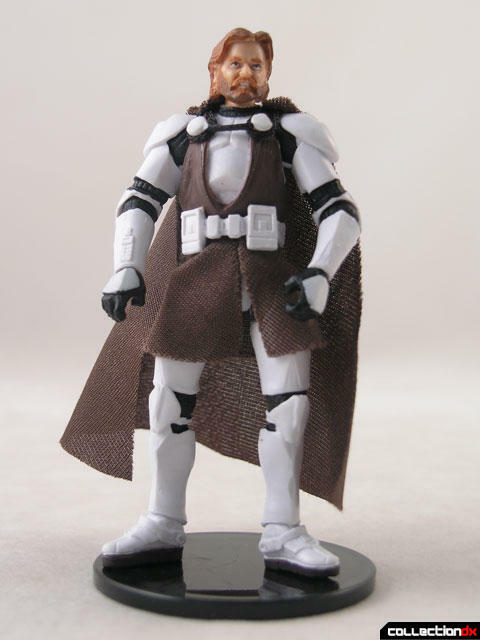 Perhaps more likely a show of solidarity than anything else, General Kenobi dons clone armor when heading out with his troopers. Its actually a hybrid mix of select armor parts and traditional jedi robes. As far as action figures go, you don't get much better than this. Old Ben is one of the most articulated and gimmick-laden star wars figure to ever be released. 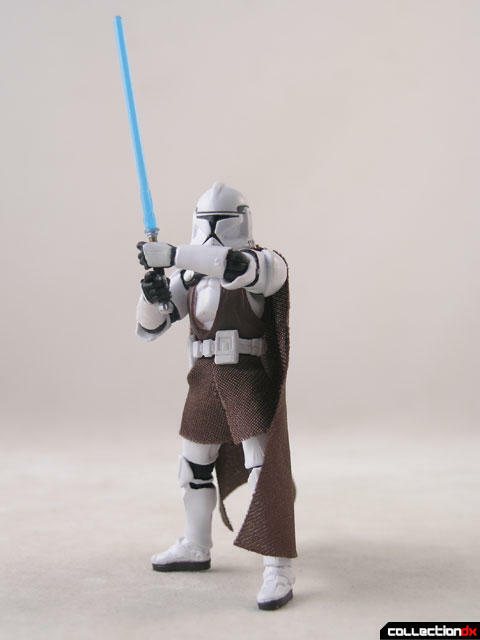 Accessories include removable helmet, lightsaber, lance, and R4-J1's leg for the build-a-droid figure. The helmet is soft rubber and fits over the head. 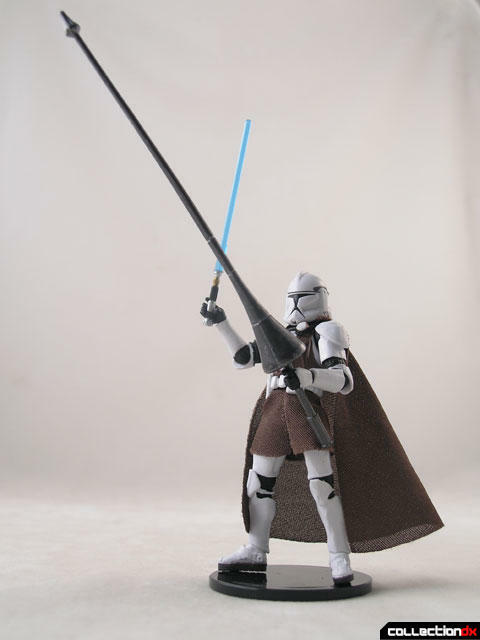 The lance is included to replicate a scene from the clone wars animated series where Obi-Wan jousts with Bounty Hunter Dirge. Parts of the figure are what we call "Soft Goods" - meaning the cloth cape and skirt. The belt is also a separate piece. The one thing that keeps this from being one of the best figures ever is the head. The head sculpt is atrocious. 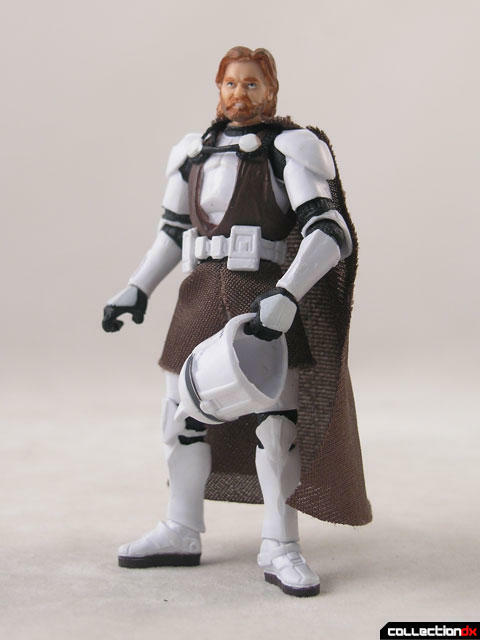 If you can find a better Obi-Wan head, switch them and you have the perfect figure. This figure is one of the better figures to come out in a few years. 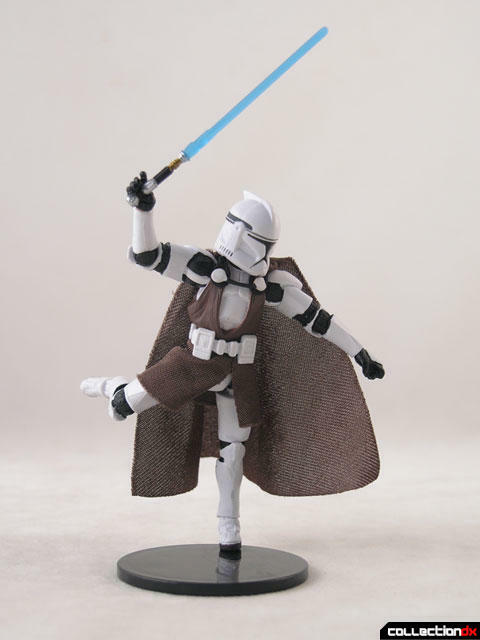 We really need a CDX article which identifies the best (or "DX") modern 3 3/4-inch Star Wars figures of the main characters from the films... most of us can't be bothered the tedious task of skimming through some of those SW websites... way more info than the casual fan needs. I don't need to know every variant of some random Fish Jedi. I just want to buy a nice classic '77-style Han Solo for me and the kids in my life. Agreed! 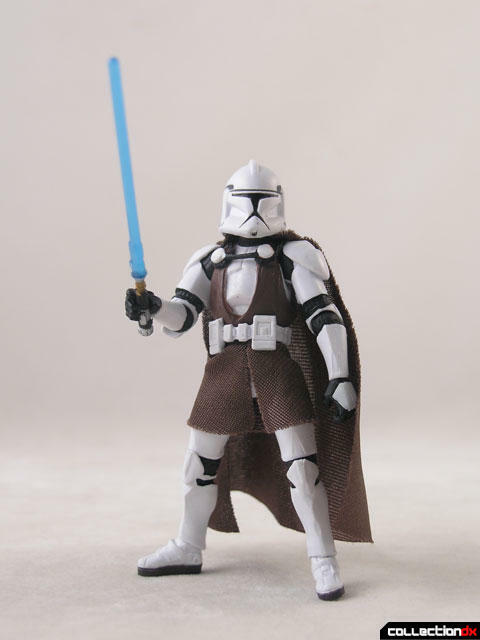 I let this figure sit on shelves for a good while until someone pointed out that the legs have outward movement and weren't the standard useless clone legs. 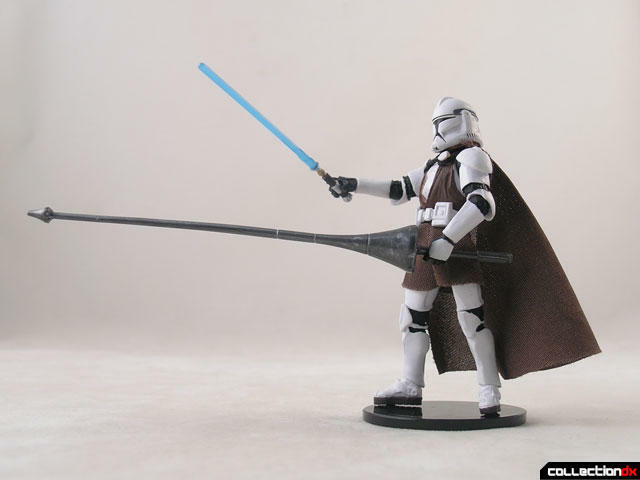 It takes way too much research just to tell if a Star Wars figure has decent articulation. Does anyone have a picture of this figure in it's packaging? With a bazillion versions out there, I don't want to mistakenly buy the wrong version. I Googled but couldn't seem to find this exact version.